There are now 266 brewery tasting rooms in the Commonwealth and sadly we have now only visited our 65th in the #VABreweryChallenge. The latest is quite close to home, the recently opened Settle Down Easy Brewing Co. (SDE). 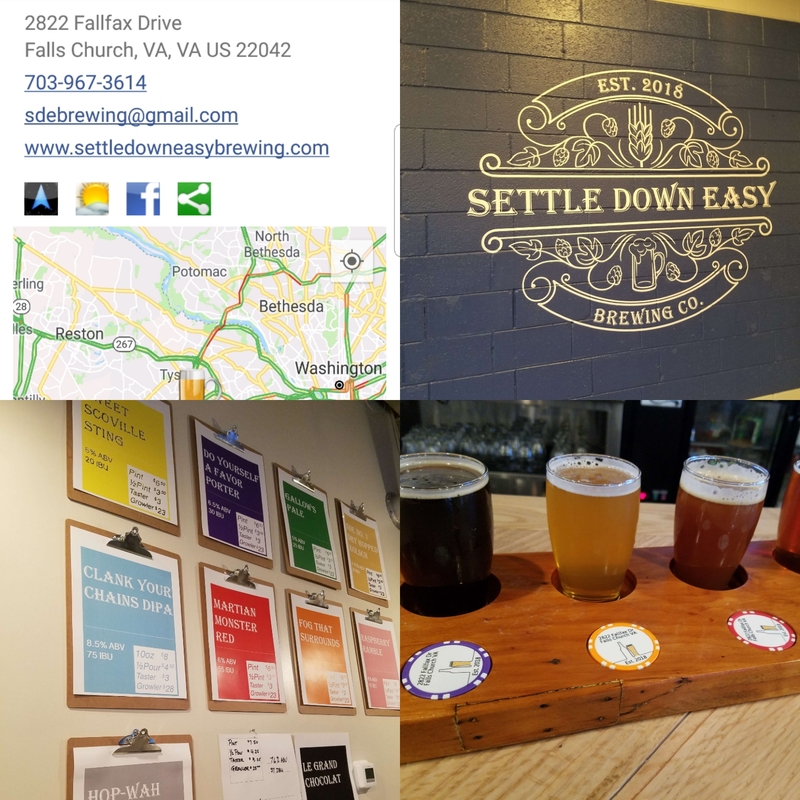 Located in Falls Church, the brewery's name is derived from lyrics in the Grateful Dead song Ramble on Rose -- but not so fast. Odell Brewing Company had trademarks rights from their Settle Down Brown, yet in a rare sign of trademark fellowship, granted the new proprietors rights to the name. There were two positive aspects I noticed when entering the brewery. The first was its spacious and open floor plan that allows visitors to flow easily between tables and the bar. Plus it provided an extensive view the brewing equipment. The second was the two British-styled beers that were listed on the color-coded tasting wall. English styles seem to be overlooked within the current craft beer market but SDE was pouring the Gallows Pale Ale and the Do Yourself a Favor Porter. I wonder if Head Brewer Henry Jager perfected these recipes at his stints at Twisted Pine Brewing Company and Heavy Seas Brewing. They are excellent examples of each style. The brewery's overall portfolio is expansive with several hopped beers to meet the current IPA fever. There are multiple IPAs, a Dry Hopped Kolsch, and a hopped Martian Monster Red. They also offer experiments with honey with the Sweet Scoville Sting Honey Jalapeno Ale (it has a kick) and the Raspberry Ramble Raspberry Honey Ale (aroma-centric and tart). But if the Imperial Chocolate Milk Stout is available on nitro, don't leave without a taste. And as always these breweries can be visited easily using theCompass Craft Beverage Finder. Sorry iPhone 11 iOS and iPhones 5S and greater users. Cheers.